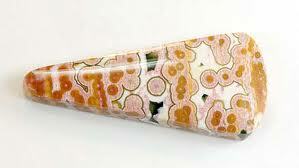 Howlite, a calcium borosilicate hydroxide (Ca2B5SiO9(OH)5), is a silicate mineral found in evaporate deposits. 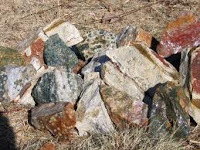 Howlite was discovered at Tick Canyon, California in 1868 by Henry How (1828-1879) He was a Canadian chemist, geologist, and mineralogist. 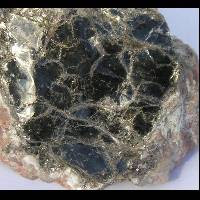 In appearance, it is white with fine gray or black veins in an erratic, often web-like pattern, and is opaque with a sub-vitreous luster. Slabs of Howlite are often painted with scenes and designs that make artistic use of these veins. 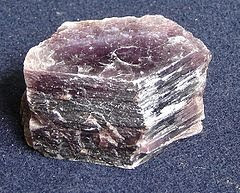 Its structure is monoclinic with a Mohs hardness of 3.5 and lacks regular cleavage. 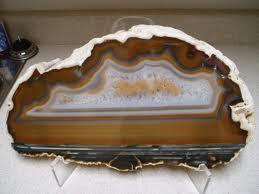 It is most often found in massive nodules that resemble a head of cauliflower and rarely in crystal form as tabular prisms. Howlite is commonly used to make decorative objects such as small carvings or jewelry components. Because of its porous texture, Howlite can be easily dyed to imitate other minerals, especially turquoise because of the superficial similarity of the veining patterns. 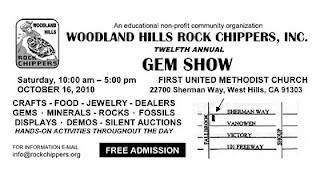 Howlite is also sold in its natural state, sometimes under the misleading trade names of "white turquoise" or "white buffalo turquoise", or the derived name "white buffalo stone". Sometimes Howlite fluoresces a blue, yellowish white or off white color under shortwave UV light and dissolves in hydrochloric acid solution without bubbling. 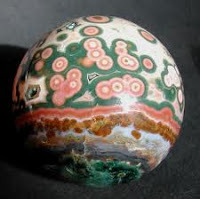 Prehnite is the first mineral ever to be named after a person, and was first described in 1789 for an occurrence in Haslach, Harzburg and Oberstein, Germany., It is named for Colonel Hendrik Von Prehn commander of the military forces of the Dutch colony at the Cape of Good Hope from 1768 to 1780. Prehnite is a member of the silicates family of minerals. 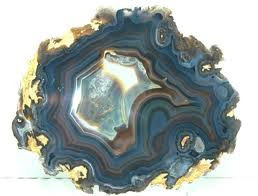 It is brittle with an uneven fracture and a vitreous to pearly luster. 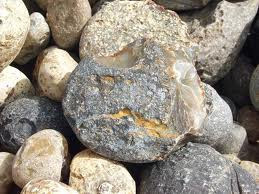 Its hardness is 6-6.5, its specific gravity is 2.80-2.90 and its color varies from light green to yellow, but also colorless, blue or white. 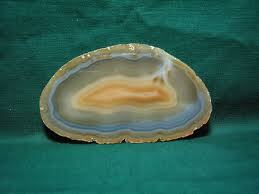 It is mostly translucent, and rarely transparent. 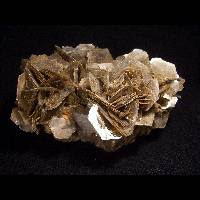 Though not itself a zeolite, it is found associated with minerals such as datolite, calcite, apophyllite, stilbite, laumontite and heulandite. 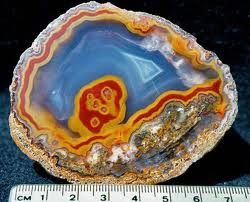 It occurs in veins and cavities of basaltic rocks and sometimes in granites and gneisses. Prehnite crystallizes in the orthorhombic crystal system, and most often forms as stalactitic or botryoidal aggregates with only just the crests of small crystals showing any faces. There are no commercial uses for Prehnite other than collecting, carving and jewelry making. 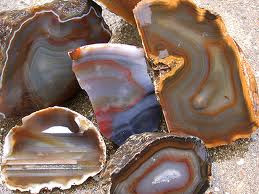 This, of course, makes it the perfect lapidary material for rockhounds. Named from the Middle English word 'sulphur' meaning brimstone. 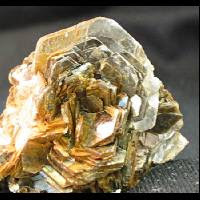 Crystals are usually yellow to yellowish-brown blocky dipyramids with thick tabular and disphenodal crystals being less common. Native sulfur is usually formed from volcanic action as a sublimate from volcanic gasses associated with realgar, cinnabar, and other minerals. 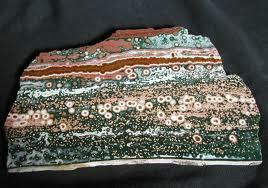 It is also found in some vein deposits and as an alteration product of sulfide minerals. 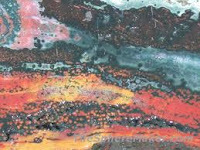 It can also be formed biogenically, a major source being salt domes, where it has formed by the bacterial decomposition of calcium sulfate. Sulfur fuses at the relatively low temperature of 113 degrees and gives off choking fumes of sulfur dioxide when burned. There are many industrial uses of sulfur ranging from matches and fireworks to rubber.